Hai-jung: Class struggle is very acute in our school. I hear that reactionary slogans have been found, some written in English on the blackboard of our English Department. Chairman: What reactionary slogans have been written? Chairman: How does it read in English? Chairman: What else has been written? Hai-jung: I don't know any others. I know only that one. Chairman: Well, let this person write more and post them outdoors for all people to see. Does he kill people? Hai-jung: I don't know if he kills people or not. If we find out who he is, we should dismiss him from school and send him away for labour reform. Chairman: Well, so long as he doesn't kill people, we should not dismiss him, nor should we send him away for labour reform. Let him stay in school and continue to study. You people should hold a meeting and ask him to explain in what way Chiang Kai-shek is good and what good things he has done. On our part, you may tell why Chiang Kai-shek is not good. Chairman: How many people are there in your school? Hai-jung: About 3,000, including faculty and staff members. Chairman: Among the 3,000 let us say there are seven or eight counter-revolutionaries. Hai-jung: Even one would be bad. How could we tolerate seven or eight? Chairman: You shouldn't be all stirred up by one slogan. Hai-jung: Why should there be seven or eight counter-revolutionaries? Chairman: When there are many, you can set up opposition. There can be teachers in opposition. Only they should not kill. Hai-jung: Our school has realized the class line. Among the new students 70 per cent are workers and sons and daughters of poor and lower-middle farmers. Others are sons and daughters of cadres and heroic officers and men. Chairman: How many sons and daughters of cadres are there in your class? Hai-jung: In addition to myself, there are two, while others are the sons and daughters of workers and poor and lower-middle farmers. They do well. I learn much from them. Chairman: Are they on good terms with you? Do they like you? Hai-jung: I think our relationship is good. I find it easy to associate with them and they find the same with me. Hai-jung: But there is the son of a cadre who doesn't do well. In class he doesn't listen attentively to the teacher's lecture and after class, he doesn't do homework. He likes to read fiction. Sometimes he dozes off in the dormitory and sometimes he doesn't attend the Saturday afternoon meeting. On Sunday he doesn't return to school on time. Sometimes on Sunday when our class and section hold a meeting, he doesn't show up. All of us have a bad impression of him. Chairman: Do your teachers allow the students to take a nap or read fiction in class? We should let the students read fiction and take a nap in class, and we should look after their health. Teachers should lecture less and make the students read more. I believe the student you referred to will be very capable in the future since he had the courage to be absent from the Saturday meeting and not to return to school on time on Sunday. When you return to school, you may tell him that it is too early to return to school even at eight or nine in the evening, he may delay it until eleven or twelve. Whose fault is it that you should hold a meeting Sunday night? Hai-jung: When I studied at the normal School, we usually had no meeting Sunday night. We were allowed to do whatever we liked that night. One day several cadres of the branch headquarters of the League (I was then a committee member of the branch headquarters) agreed to lead an organized life on Sunday night but many other League members did not favour the idea. Some of them even said to the political counsellor that Sunday was a free day and if any meeting was called at night, it would be inconvenient for us to go home. The political counsellor eventually bowed to their opinion and told us to change the date for the meeting. Chairman: This political counsellor did the right thing. Hai-jung: But now our school spends the whole Sunday night holding meetings -- class meetings, branch headquarters committee meetings or meetings of study groups for party lessons. According to my calculation, from the beginning of the current semester to date, there has not been one Sunday or Sunday night without any meetings. Chairman: When you return to school, you should take the lead to rebel. Don't return to school on Sunday and don't attend any meetings on that day. Hai-jung: But I won't dare. This is the school system. All students are required to return to school on time. If I don't people will say that I violate the school system. Chairman: Don't care about the system. Just don't return to school. Just say you want to violate the school system. Hai-jung: I cannot do that. If I do, I will be criticized. Chairman: I don't think you will be very capable in the future. You are afraid of being accused of violating the school system, of criticism, of a bad record, of being expelled from school, of failing to get party membership. Why should you be afraid of so many things? The worst that can come to you is expulsion from school. The school should allow the students to rebel. Rebel when you return to school. Hai-jung: People will say that as the Chairman's relative, I fail to follow his instructions and play a leading role in upsetting the school system. They will accuse me of arrogance and self-content, and of lack of organization and discipline. Chairman: Look at you! You are afraid of being criticized for arrogance and self-content, and for lack of organization and discipline. Why should you be afraid? 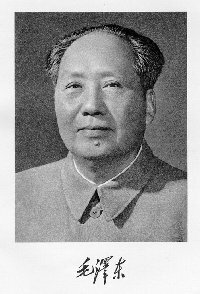 You can say that just because you are Chairman Mao's relative, you should follow his instructions to rebel. I think the student you mentioned will be more capable than you for he dared to violate the school system. I think you people are too metaphysical. Hai-jung: People now are against reading classical works. But the son of a cadre in our class devotes all his time to reading them. All of us are busy practicing speaking English, but he is reading the Hung Lou Meng [Dream of the Red Chamber]. We are all critical of his reading this novel. Chairman: Have you ever read Hung Lou Meng? Chairman: Which character do you like in this novel? Chairman: Hung Lou Meng is worth reading. It is a good book. We should read it not for its story but as history. It is a historical novel. Its language is the best in classical fiction. The author, Ts'ao Hsueh-ch'in, had made a lively portrayal of Feng Tzu. The characterization of Feng Tzu is excellent. You won't be able to do the same. If you don't read Hung Lou Meng, how could you know about feudal society? Before you read Hung Lou Meng, you should know these four sayings: 'The Chias are not false. They use white jade to build a hall and gold to make a horse.' [This refers to the Chia family.] 'The A Fang Palaces spread for 300 li, but they could not accommodate a Shih.' [This refers to the Shih family.] 'The Eastern Ocean lacks a white jade bed, but the Dragon King invites the King of Ch'en Ling to visit him.' [This refers to Feng Tzu's family or the Wang family] 'What a big snow in this year of plenty - pearls cheap like earth and gold like iron!' [This refers to Hsueh Pao-chi's family.] These four saying summarize the story of Hung Lou Meng. Chairman: Have you read Tu Fu's long poem 'The Northward March? Hai-jung: No, It is not in T'ang Ssu San Pai Shou [Three Hundred Poems of T'ang]. Hai-jung: What problems should I pay attention to when I read this poem? What precaution should I take against its influence? Chairman: You are always metaphysical. Why should you take precaution? No, you should receive some influence. You should go deep in it and then emerge from it. Read it over and over again but not necessarily memorize it. Chairman: Are you required to study the Holy Bible and Buddhis sutras? Hai-jung: No, Why should we read them? Chairman: How can you do translations or handle foreign affairs if you do not study the Holy Bible and Buddhist sutras? Have you read Liao Chai [Stories from the Strange Studio]? Chairman: Liao Chai is worth reading. It is well-written. The fox spirits in Liao Chai are kind-hearted. They voluntarily help mankind. Chairman: How do you say 'chih shih fen tze' [intellectual] in English? Chairman: You have studied English for half a year. You are a chih shih fen tze yourself and yet you don't know how to say it in English. Hai-jung: Let me look it up in the Chinese-English Dictionary. Chairman: Look it up. Is there such a term? Hai-jung: (After leafing the pages of the dictionary) Too bad. There is no such term in your Chinese-English Dictionary. It has only the term chih shih, but no chih shih fen tze. Chairman: Let me take a look. (I handed the dictionary to the Chairman.) You found chih shih, but no chih shih fen tze. This dictionary is useless. It is short of many words. When you return to school, ask them to compile a better Chinese-English Dictionary. It should have all political terms and there should be sentences to illustrate the use of each word. Hai-jung: How can our school compile a dictionary? We have neither time not personnel to do it. Chairman: There are many teachers and students in your school. Why should you doubt their ability to compile a dictionary? Let this dictionary be compiled by your school. Hai-jung: All right. I will transmit your order to our leadership when I return to school. I think we can perform this task.